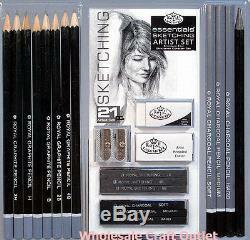 21 pc SKETCH & DRAWING SET w/PENCILS, CHARCOALS, ERASERS. 21 pc SKETCH & DRAWING SET w/PENCILS, CHARCOALS, ERASERS & SHARPENERS. Comprehensive Set - Great for students and artists of all skill levels! These quality drawing pencils are equally capable of producing quick sketches or finely worked drawings. Of all drawing media, pencils are the most immediate, versatile and sensitive. Essentials pencils from Royal & Langnickel can be used for soft, delicate qualities or bold, crisp sharpness and the selection included in this set is perfect for artists of all skill levels. Included in the set: Sketch pencils in H, 2H, 4H, HB, B, 2B, 4B, 6B C harcoal Pencils in Soft, Medium and Hard grades 1 Woodless Pencil 8B 3 Sketching Graphite Sticks 1/4" square x 2-1/2" long (2B, 4B, 6B) 3 Charcoal Sticks 1/4" square x 2-1/2" long (Soft, Medium, Hard) 1 white plastic eraser 1 kneaded eraser 1 double sharpener for pencils & charcoals ALL Packed in a reusable clear plastic clamshell case. CHECK OUR STORE FOR DRAWING PAPER PADS, RICE PAPER ROLLS, SKETCH BOOKS and much more! The item "21 pc ARTIST SKETCHING SET with DRAWING PENCILS, CHARCOAL STICKS, ERASERS & MORE" is in sale since Friday, January 10, 2014. This item is in the category "Crafts\Art Supplies\Drawing\Pencils & Charcoal". The seller is "ehobbycraft" and is located in Mount Ephraim, New Jersey. This item can be shipped to United States, to United Kingdom, DK, RO, SK, BG, CZ, FI, HU, LV, LT, MT, EE, to Australia, GR, PT, CY, SI, to Japan, to China, SE, KR, ID, to Taiwan, ZA, TH, to Belgium, to France, to Hong Kong, to Ireland, to Netherlands, PL, to Spain, to Italy, to Germany, to Austria, RU, IL, to Mexico, to New Zealand, PH, SG, to Switzerland, NO, SA, UA, AE, QA, KW, BH, HR, MY, TR, BR, CL, CO, CR, DO, PA, TT, GT, SV, HN, JM, to Canada.